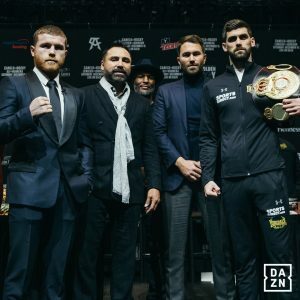 On Saturday night Golden Boy Promotions top promotional star, Canelo Alvarez, will make his debut in New York City and on the DAZN Streaming Network when he faces off against Rocky Fielding for Fielding’s WBA Super Middleweight title. This bout will take place at the famed Madison Square Garden and features a rather stacked undercard. The co-main event of the night was originally supposed to be between David Lemieux and Tureano Johnson, but Lemieux had to withdraw due to dehydration issues and the bout between Tevin Farmer and Francisco Fonseca will take it’s place. Other notable undercard fights include a welterweight bout between Sadam Ali and Mauricio Herrera, an IBF/WBA Women’s Lightweight Title bout between Katie Taylor and Eva Wahlstrom, and two bouts featuring high rated prospects Ryan Garcia and Lamont Roach Jr.
DAZN has gone all in with their partnership with Golden Boy Promotions and Canelo Alvarez, and this is the first of an eleven fight contract that they have with Canelo. Tevin Farmer is one of those feel good stories in the sport of boxing. He wasn’t a heralded amateur and started his career with a 2-2 record, but he has shown significant improvement since his professional debut and was able to win the IBF Super Featherweight Title. Farmer only had sixteen amateur fights so he had to learn quickly on the job. He’s not known for his power, he has only stopped six of his opponents and was stopped twice in his career. He lost by TKO in his very first professional fight and was later stopped by Jose Pedraza. His opponent, Francisco Fonseca, has stopped sixteen of his opponents and was only stopped one time in his career, a knockout loss to Gervonta Davis. Fonseca will have a slight inch and a half height advantage and a two and a half inch reach advantage. Fonseca has fought mainly in Panama and Costa Rica against suspect opposition. He lost his only fight outside of Central America. His biggest win to date was against a 13-3 Daniel Miranda. He’s been fairly active and fought once in 2018 and four times in 2017. Farmer fought twice in 2018 and twice in 2017. He’s shown significant improvement since his debut, especially defensively, and has beaten the likes of James Tennyson, Billy Dib, Arturo Santos Reyes, Ivan Redkach, and Angel Luna. This is a bout that Farmer should win by decision. Farmer is angling for a future fight with Gervonta Davis and he’ll need an impressive performance to get the boxing community talking about a potential fight with Davis. Canelo Alvarez is arguably boxing’s biggest, active star. He’ll be chasing history on Saturday night as he looks to win a title in his third weight class, and become the ninth Mexican boxer to do so. Canelo is in the midst of his prime at 28 years old and is three years younger than his opponent. However, Canelo is the smaller man and will be giving up height, reach, and size to Fielding. Canelo turned pro at the age of fifteen, so Fielding has more amateur experience than Canelo as he experienced some success as an amateur on the English circuit. Canelo also has significantly more power in his punches than Fielding. He has stopped 34 of his opponents while Fielding has only stopped fifteen. Fielding also has a TKO loss on his record when he was stopped by Callum Smith. Canelo’s lone loss was to Floyd Mayweather Jr. five years ago and he has never been stopped. Both fighters have been fairly active. Canelo fought twice in 2017 and once in 2018 while Fielding fought twice in 2018 and in 2017. Canelo has a long list of accomplished opponents that he has beaten. He has defeated the likes of Gennady Golovkin, Julio Cesar Chavez Jr., Liam Smith, Amir Khan, Miguel Cotto, James Kirkland, Erislandy Lara, Alfredo Angulo, Austin Trout, Shane Mosley, and Carlos Baldomir. Fielding’s biggest wins were against Tyron Zeuge for the WBA Super Middleweight title, David Brophy, John Ryder, and Brian Vera. This will only be his second fought outside of the United Kingdom and his first fight in the United States. It’s likely Fielding’s size advantage will give Canelo some problems early on, but Canelo’s skill is levels above Fielding and he should win quite comfortably in his New York City debut.